We make these beans a lot. I always make a double batch. 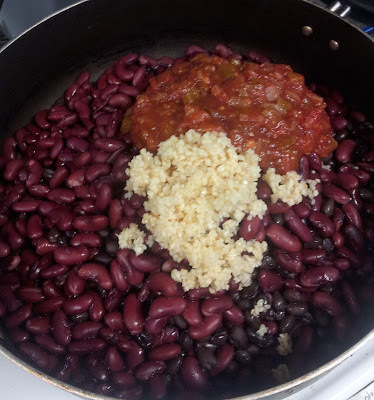 It makes a lot of beans and they don't particularly look appetizing after they are done. They smell amazing though! My boys come in and look at the dark mashed beans and turn the other way. This is the easiest recipe. And super versatile too. You can put these re fried beans on just about anything. It makes for a fantastic taco salad. Or just on a plate with some spinach, rice and avocado. 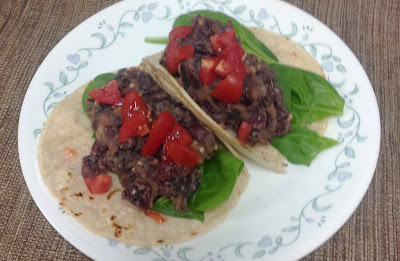 Bean burritos of course are super quick and easy. I use jarred garlic for this. I use quite a bit of garlic with these beans, I love garlic. You can also add whatever kind of salsa you like. We use medium so it gives it a bite but not too spicy. Feel free to add mild or kick it up and add some spicy! My brother always puts hot sauce on his burritos so clearly it isn't hot enough for him. 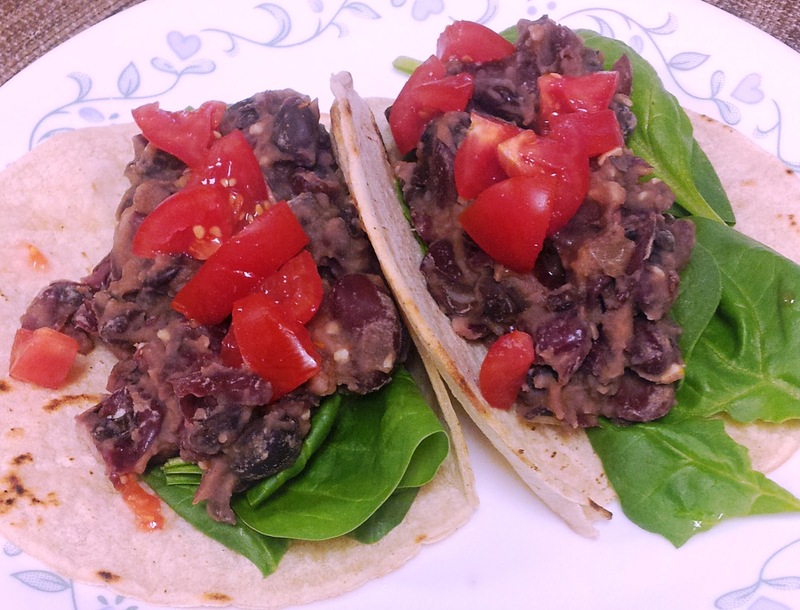 This is Day 4 of 30 days of vegan recipes. 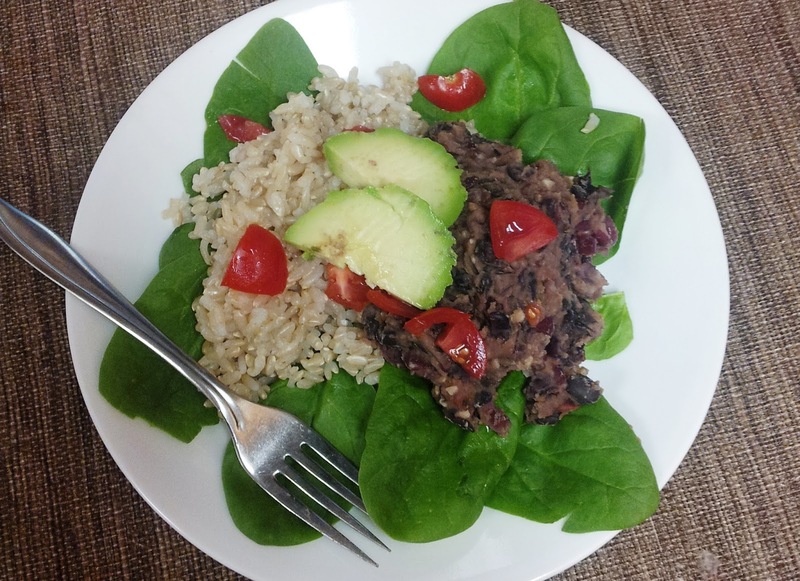 Elena's 30 day Body by Plants Boot Camp calls for a whole lot of raw foods combined with some cooked meals to maximize healing benefits of foods. No junk, coffee, oils, processed foods and sugars. Time to rid the body of junk! I like to eat one cooked meal for dinner. These bean burritos are perfect! Delicious and filling. Combined beans and water in large pan. Add salsa, garlic, salt and chipotle powder. Stir, cover and heat for about 5 minutes. Mash beans until desired consistency. Add more water if it is too dry. Cook for another 3 - 4 minutes if it is too wet.